This site is dedicated to helping Christian women be the women God wants us to be - at home, at work, in the church and in the community. Through teaching, encouraging and edifying one another, we can all become women who will glorify God with our lives. The name for the site comes from Tabitha in Acts 9:36 who was known for her acts of kindness. Like Tabitha, let us use our hearts, our hands and our homes to serve God. The Bible is a book about a love story. It is about God’s love for humanity, His wooing of our affection through the mediator, His Son. The word love (various forms) is found 419 times in the Bible. The book of 1 John has love for its theme. It tells us that “God is love” (1 John 4:8), and then shows that God has demonstrated—made manifest—His love (3:16; 4:9–10). Love is not just something we feel; it is more often something we do. Love requires action; it is demonstrated through behavior. God’s love is more than just talk; He demonstrated compassion so we would learn to be compassionate. As Paul said, “Faithful is he that calleth you, who also will do it” (1 Thessalonians 5:24). John wrote, “My little children, let us not love in word, neither in tongue; but in deed and in truth” (1 John 3:18; cf. James 2:15–16). God demonstrates His love for us by gift-giving. One of the “five languages of love”2 is “gift-giving.” We enjoy surprising our mates with a little something we picked up on a trip. We take pleasure in giving presents to our children during the holidays. We celebrate graduations, weddings, and births with gift-giving. God also uses this “love language” to express His sentiments to man. 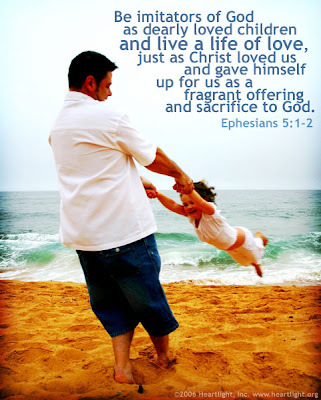 He “gave gifts unto men” (Ephesians 4:8). He leaves no one out—even His avowed enemies get daily gifts from the Creator they deny. “The Lord is good to all: and his tender mercies are over all his works” (Psalm 145:9). He gives us sunshine and rain, fruitful seasons, and beautiful vistas. Paul and Barnabas explained that God had “left not himself without witness, in that he did good, and gave us rain from heaven, and fruitful seasons, filling our hearts with food and gladness” (Acts 14:17; cf. Matthew 5:45). God demonstrates His love for us through the life of His Son. Jesus helped us to get to know the God of love. Love (various forms) is found eighty-six times in the eighty-nine chapters of Jesus’ biographies (when compassion is added, the total increases to one hundred times). Jesus told Philip, “He that hath seen me hath seen the Father” (John 14:9). We saw Jesus’ love demonstrated in feeding hungry people (John 6), healing hurting people (Matthew 4:24), directing lost people (Matthew 9:35–36), correcting wrong people (Matthew 23), accepting rejected people (Luke 19:1–10), and dying for lost people (Matthew 20:28). Someone once wrote about a traveler who fell into a deep pit and couldn’t get out. Several persons came along and saw him struggling in the pit. 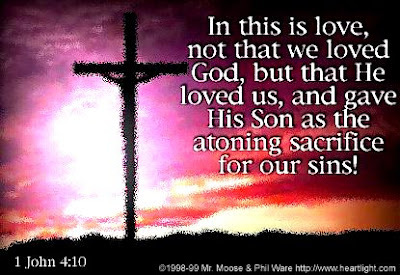 God demonstrates His love for us through the death of His Son. God has an infallible track record. He can be trusted. He has proven beyond question that He loves us. The Bible says, “But God commendeth4 [demonstrated] his love toward us, in that, while we were yet sinners, Christ died for us” (Romans 5:8). John Griffith lived in Oklahoma in 1929, and he lost all he had in the stock market crash. He moved to Mississippi, where he took a job tending a bridge for a railroad trestle. One day in 1937, his eight-year-old son, Greg, spent the day with his dad at work. He played in the office that morning and asked a thousand questions. Then a ship came through and John opened the drawbridge. Suddenly, he realized his son wasn’t in the office. Frantically he looked around, and to his horror saw him climbing on the gears of the draw bridge. He hurried outside to rescue his son, but just then he heard what he knew was a fast-approaching passenger train, the Memphis Express, filled with four hundred people. He yelled to his son, but the noise of the now clearing ship and the oncoming train made it impossible for the boy to hear him. John Griffith realized his horrible dilemma. If he took the time to rescue his son the train would crash and kill all aboard. If he closed the bridge, he would sacrifice his son. He made the decision he would relive ten thousand times and pulled the lever to close the bridge. As the train went by he could see some passengers’ faces. Some were reading, some waved, and all were oblivious to the sacrifice that had just been made on their behalf. God once faced a similar dilemma. He could not save sinners and spare Jesus, too. How could He be “just” and “justifier” at the same time? (cf. Romans 3:26). God had to allow the jaws of death to close in on His Son. He “spared not his own Son, but delivered him up for us all” (Romans 8:32). Millions go by oblivious and indifferent, even some who know the sacrifice. Since people are looking for love, and “God is love” (1 John 4:8), God is what people are looking for! 1 “God Is Love,” Scott R. Bayles, SermonCentral.com. 2 According to Gary Chapman’s best-selling book The Five Language of Love. 5 For more, see The Scourging of Jesus. In Acts 28, after Paul and his shipmates survived a shipwreck and landed on Malta, the stranded passengers found themselves cold and wet in a strange place. The natives, however, were friendly and built a fire for them all (Acts 28:2). It is interesting that Paul "gathered a bundle of sticks and laid them on the fire" (3). This was when Paul was bitten by an apparently deadly viper. Somehow, in reading this part of Paul's journey to Rome, I overlooked a fundamental fact that helped make Paul great. Paul did his part. When the others had built that fire, Paul was not content to let the others do it all. He did his share. Not only that, he did his share even at great, personal cost. He did his share, though he might have rationalized that he had already done so much and been through so much. Paul noted their unusual kindness and was made to feel very welcome. He showed his appreciation in a tangible way. You may be a busy, active servant of God. You may have done much in the past for the cause of Christ. Yet, think about how notable it is and inspiring to others, when you gather your own bundle of sticks to help the fire others have started. It may be noted and remembered long after you are gone. I have been dabbling in knitting design (for evidence see here, here or here)and I have come to the conclusion that designing is actually hard work. It takes a significant amount of creativity and thought to convert an idea into a concrete item and then to put that information into a format that someone else can understand and appreciate. It is not something that happens by accident or without a bit of effort. Yet, there are those who say just the opposite about the world in which we live. There are those who think that the beauties and wonders of this universe are just happy accidents that occurred over billions and billions of years. But is that really true? If you will kindly indulge me, I would like to share with you my journey to a deeper understanding of the origins of the universe. This has been a long and often difficult process for me. One that frequently required to rethink what I had been taught. Since this was a rather lengthy process, I will not attempt to write it all in one post. First, let me give tell you a little bit about my background. I was reared in a semi-religious home. My family was sporadic in church attendance so while I had been given a reasonable exposure to the Bible, it was not something that was deeply ingrained in me. When I went to college, I, for the most part, gave up religion. I found "churches" to be full of hypocrites and I came to doubt most of what I was taught as a child. Throughout elementary and high school my favorite subject was always science so when I went to college, science was the natural course of study for me. Though my emphasis changed several times while I was in college (shifting from a medical to a research orientation), my major field of study was always science (biology/math major; chemistry minor). There was a precision and order to the sciences that I found very appealing. There was a beauty to the way one branch of science interacted with another that I found fascinating. The course of study in any science field is pretty strenuous. There aren't a lot of “goof-off “ classes and most of the allowed electives are science electives. So most semesters, I took at least one biology, one chemistry and one math and usually one other science (physics, geology, etc). Biology, being the science of life, gave me more opportunity to study the how life began, how species are interrelated and how it all fits together. The rigorousness of a biology program doesn't provide one much time to digest what is learned. Mostly, you were stuffing the information into your head as quickly as possible in order to spit it back out on the tests. There simply wasn't time to question things, because you were too busy learning a of myriad facts - phyla, genera, species, bones, muscles, tissues, organs, etc. Your head was so full of facts that there was little room for logical reasoning. It was in this environment that I learned the theory of evolution and the general theories on the origin of the universe. I will begin by explaining in simple terms the origin of the universe from the biological standpoint. According to what I was taught, the universe began when a ball of matter inexplicably exploded causing a great release of energy and sending bits of itself spiraling outward throughout the universe. Some bits of this matter formed stars, others formed planets, still others formed asteroids or other various space rocks. As the spiraling continued, some of the bits of miscellaneous space debris began developing orbits around the various stars, giving rise to solar systems. Through a series of random occurrences, the earth developed an orbit around its star (our sun) at a location that was neither too close nor too far from its source of heat and light. That unique location allowed the formation of certain organic (carbon-based) compounds in a sort of primordial soup. That group of chemicals was then radically changed by some major dynamic event (a lightning strike, for instance) to become the first living organism. Over a period of hundreds of billions of years, this organism evolved from a single cell creature to a multi-celled organism and eventually, through a combination of random mutation and natural selection, into the thousands of species that we see today. That is the short version. There is some biological evidence that would seem to support this theory. For example, the similarity of features between one species and another would seem to suggest that they were once related. The bone structure of the frog, for example, is remarkable like that of the human. A pig fetus develops in a manner similar to a human. Is this proof that these radically different species developed from common ancestors? Or is there another possible solution? In my study of knitting design, I have come to realize that I can recognize certain style elements of a particular designer. I can look at a pattern and often know who the designer is based on the overall style or certain unique design elements of the item. Likewise, there is also a similarity between the different projects of architects, painters, sculptors, etc. Is it not possible then, that the reason there are so many similarities between one species of animal and another is simply that they had the same designer? 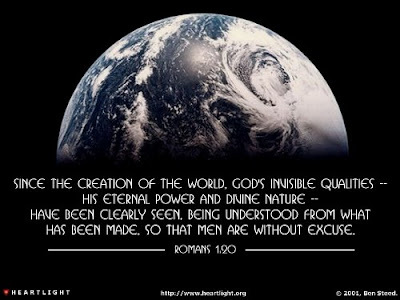 Is it possible that rather than the elaborate theories of evolution, that it is possible that the earth could actually have been created exactly the way the Bible claims? We will explore these ideas in the coming posts. I am hoping that you will enter these studies with an open mind. I admit to a certain amount of bias when I began searching for these answers. As I college student, I tended to accept the word of my professors without question. I hope that you will enter into this study with the desire to follow where the evidence leads. We sometimes refer to someone's actions as "playing God." By that, we usually mean that they are standing in judgment over another person in a way that only God can, or that they are making a decision regarding who will live or who will die. Most of the time, we use that term in a negative way. I heard a story recently, though, told by Mee Spousler that sheds a whole new light on the term "playing God." Mee tells how she was trying to put her three-year-old son to bed for a nap. When she was unsuccessful, she put him in her bed and laid down with him to encourage him to rest. She fell asleep, but he didn't. When she woke up, she saw him sitting on a chair at the end of the bed, and asked, "Luke, what are you doing?" Wouldn't it be great if we could all, like that 3-year-old boy, learn to "play God" in ways that would impact this world for good? We need to "play God" by looking at the hearts of people rather than the clothes they are wearing. We need to "play God" by forgiving those who have offended us. We need to "play God" by refusing to allow race or the color of a person's skin to create barriers. We need to "play God" by being patient, kind, and loving to the the people we deal with throughout the day. We need to "play God" by showing compassion to those who are suffering or in need. We need to "play God" by keeping our promises and living lives of honesty and integrity. We need to "play God" by living in such a way that we reflect the nature of our Heavenly Father. I hope and pray that people around you will see you "playing God" this day. There are some people hard to overlook. There's the lady wearing the big hat with a potted plant on it. There's the older man with the bushy white hair and plaid sports coat. There's the six year old that stands six-foot-three. There are also those people that it may be easy to overlook. We don't mean to or want to, but seem to. Sometimes, we overlook them because they keep to themselves and don't really want to be seen. Others, however, are so unassuming that they are easy to miss. There are instances, unfortunately, where we are too caught up in ourselves or our circle of friends so that we fail for lack of trying. THE POOR. We have them with us always (Mark 14:7). 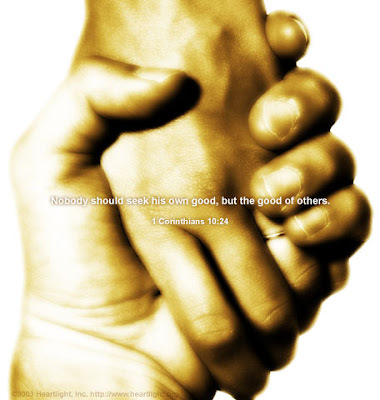 The Lord wants us to care about them and care for them (1 Jn. 3:14ff). They likely lack influence or the ability to do anything for you, but they need your attention. THE NEW CHRISTIAN. They are highly impressionable and vulnerable. They start their Christian walk standing at the fringe and need us to "pull them in" the fellowship. Their faith is fledgling. Their new life may have them feeling lonely and strange. Let's not leave these babes at the baptistery steps to fend for themselves. THE ELDERLY. Their peer group is shrinking. They often are widowed. They grew up in a completely different age, but they have those basic human needs--including companionship. They still possess a great capacity to love, feel, and share. Don't pass by the hoary head. SMALL CHILDREN. You may have to stoop down or slow down to notice them, but they are there. You may extend your hand to shake theirs and see them disappear into mom's skirt or run the other way. No matter. Your notice of them will not be unnoticed to them. They will remember you for remembering them. TEENAGERS. Outwardly, they look aloof, unconcerned, occupied, or, at times, uninterested in your attention. Yet, many times, they are looking for identity, struggling with self-confidence, and coping with major life changes. They need notice. THE NEWCOMER. They have uprooted and chanced to leave the familiar for the unfamiliar. Imagine yourself in their shoes, now in a new setting and faced with fitting into a new family. That's not easy! Practice the golden rule. Let them in. THE STRANGER. They are the visitor, often straight off the street. They are processing their first impression. You may pause and look at them, not know what to do or say, and keep moving. Please don't do that! Greet them. Welcome them. Find out about them. Tell them about yourself. Make sure they leave you no longer a stranger. Overlook them and they may not return...ever. If they are a non-Christian or wayward Christian, they may find in you a lifeline that changes their eternity. THE STEADY. The quiet worker, the "always there," and the disciple behind the scenes may enjoy escaping the "lime light," but they yearn for and desire the human connection, too. Let us never take them for granted. Without them, we would greatly suffer. We all do it, but let's not take comfort in it. Notice even those that we may mistake for the "little people." Remember, that God sees no "little people." He sees souls. So must we! I will not strike back. If someone is rude, if someone is impatient, if someone is unkind, I will not respond in that way (Romans 12:19). I will ask God to bless my enemy. If I come across someone who treats me harshly or unfairly, I will quietly ask God to bless that individual (Matthew 5:44). I understand my enemy could be a family member, a neighbor, a co-worker, or a stranger. I will be careful about what I say. I will carefully choose and guard my words, being certain that I do not spread gossip (James 3:1–6). I will go the second mile. I will find ways to help share the burden of another person (Matthew 5:41). I will forgive. I will forgive those who hurt me (Luke 23:34). I will secretly do something kind for someone. I will reach out anonymously and bless the life of another (Ephesians 4:32). I will treat others the way I wish to be treated. I will practice “the Golden Rule” (Matthew 7:12). I will do unto others as I would have them do to me, with everyone I encounter. I will raise the spirits of someone who is discouraged. My smile, my words, my expressions of concern and support can make a difference to someone facing a challenge (Romans 14:19). I will take care of my body. I will eat less . . . I will eat healthier . . . I will exercise . . . I will be thankful . . . My body will be a fitting temple for Him who dwells in me (1 Corinthians 6:19–20). I will grow spiritually. I will spend more time in study, prayer, and meditation. I will retreat from life’s pressures and distractions and seek to learn God’s will (2 Peter 3:18). "So if there is any encouragement in Christ, any comfort from love, any participation in the Spirit, any affection and sympathy, complete my joy by being of the same mind, having the same love, being in full accord and of one mind. Have this mind among yourselves, which is yours in Christ Jesus,who, though he was in the form of God, did not count equality with God a thing to be grasped, but made himself nothing, taking the form of a servant, being born in the likeness of men. And being found in human form, he humbled himself by becoming obedient to the point of death, even death on a cross. 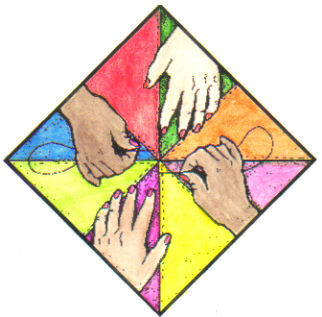 To receive our monthly Tabitha's Heart & Hands newsletter and notice of site updates, please enter your name and email address into the form below. Your email address will not be sold, rented or shared with anyone. It will only be used for sending the newsletter. Copyright Information. All materials on this site are protected by copyright. The materials on this site are the property of Tabitha's Heart or the specified author and are used with permission of the original author. Permission to reprint must be obtained from the original author. Links to the author's sites are provided for your convenience. Nothing on this site may be reprinted for sale. 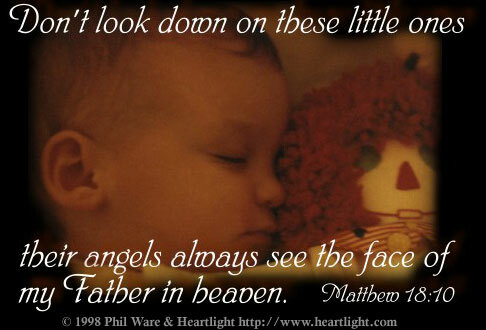 Some of the graphics are from Heartlight Christian Graphics and are used according to their guidelines. All knitting patterns are original designs belonging to Tabitha's Heart and are also protected by copyright. They are offered free of charge to encourage their use in knitting ministries. You are free to use this pattern for personal and non-commercial use or for teaching knitting classes provided the classes are offered free of charge and credit is given to the designer. You may not sell any pattern in either electronic or print form or use it in any way for financial gain without express written permission of the owner. In short, I am not making money from my work so you shouldn't be either. You may not distribute the pattern in print or electronic form without the express written permission of the owner. If you would like to share this pattern with your friends, please direct them to the Tabitha's Heart website. All materials offered by Tabitha's Heart are provided for free. We do not sell anything, nor do we accept advertising or donations.